Diablo III "In the Home Stretch"
Diablo III game director Jay Wilson says that the team making Blizzard's highly-anticipated dungeon-crawler is in final-stretch crunch mode. I've gotten hands-on time with Blizzard's Diablo III at the past three BlizzCons, and every time I've played it I've had a tremendously good time. The game is shaping up to be fantastic - and every bit a proper Diablo title - but Blizzard is staying true to its secretive form, and refusing to nail down a release date (or even a target). There may be a light at the end of the tunnel, however. A writer for the New York Times spent some time with Diablo III, and spoke with game director Jay Wilson. While Wilson was cagey regarding a release date for the game, he said that development was "definitely in the home stretch. We're crunching. This is when the magic happens." 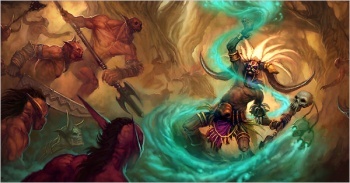 According to the Times, one reason the game's development has taken so long (in addition to Blizzard's notorious perfectionism) is that the developers were working on a way for all Diablo players to be able to trade items with one another instead of just hopping chat channels on Battle.net hoping to find someone who wants their life-stealing polearm. Given how central item-trading is to the core of Diablo, and how notoriously broken Diablo II's economy was, I can't blame them for wanting to overhaul the system. It also fits in line with Blizzard's other initiatives like the RealID plans (the good parts of it, not the quickly-nixed forum-posting part) and a universal Battle.net. This new service could look like a global WoW auction house, or it could resemble the Global Trade services in recent Pokemon games - but Blizzard isn't tipping its hand just yet. This is another sign that the Diablo III team desperately wants to ship the game this year, as do gamers around the world. Still, let us not forget that "in the home stretch" is as subject to Blizzard's glacial development speed as anything else: We first heard that StarCraft II was in the "final stretch" back in February 2009. The game actually came out in July 2010. So we're looking at August 2012 then. Good to know.